One of the things I used to do on my free-time was standing in the kitchen alone wondering what I can cook, and making whatever came to my mind. But these days I’m finding it’s hard to spot my “free” time and I can hardly stay in the kitchen alone with two little ones nagging for food or play. It really stresses me out sometimes, because I want to cook something for them which is nutritious and with variety of ingredients, but on the other hand if preparation takes long then they will start drag me out from the kitchen. Here is one of my life-saving recipe. 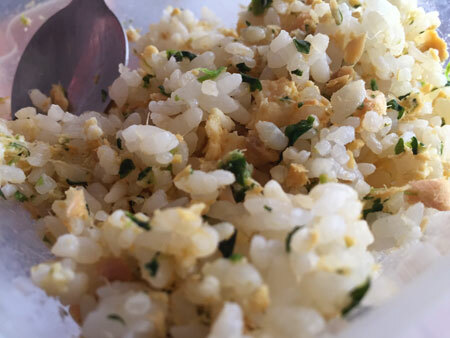 Maze-gohan is seasoned rice with variety of ingredients. Different from takikomi-gohan, maze-gohan is plain steamed rice mixed with cooked ingredients (where takikomi-gohan is cooked rice with ingredients and seasonings). Heat a frying pan, and spray oil. Cook salmon and spinach, stirring, for 1~2 minutes. Beat egg in a small bowl, and pour into the frying pan. Stir using chopsticks or wooden spatula to scramble. Drizzle sesame oil, and season with soy sauce. Sprinkle sesame seeds and turn off the heat. You can add small amount of oyster sauce or more soy sauce if you like. I use leftover cooked rice from day before; warm up the rice in the microwave before mixing with salmon. You can cook this salmon first (while your kids are taking nap or watching tv) and keep in the fridge. When they are hungry, just mix with warm rice and done!